Heat the oven to 400°F. Beat the egg yolk and 1 tablespoon water in a small bowl with a fork. Heat the oil in a 2-quart saucepan over medium heat. Add the onion and cook until tender, stirring occasionally. Stir in the remaining water, the salt and margarine and heat to a boil. Remove the saucepan from the heat. Stir in the milk. Slowly stir in the potato flakes. Let the potato mixture cool to room temperature. Sprinkle the work surface with the flour. Unfold 1 pastry sheet on the work surface. Roll the pastry sheet into a 16 x 12-inch rectangle. Repeat with the remaining pastry sheet. With the short side of 1 pastry sheet facing you, spread half the mustard on the bottom half of the pastry to within 1-inch of the edge. Spoon half the potato mixture across the middle of the pastry to within 1/2 inch of the sides. Layer half the smoked turkey, roast turkey and pastrami on the bottom half of the pastry. 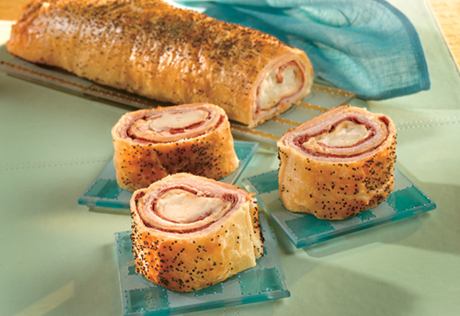 Starting from the top half of the pastry, roll up like a jelly roll. Place seam-side down onto a baking sheet. Tuck the ends under to seal. Brush the pastry with the egg mixture. Sprinkle with the poppy seed. Repeat with remaining pastry. Bake for 25 minutes or until the pastries are golden brown. Let the pastries cool on the baking sheets on wire racks for 10 minutes. Time-Saving: You can omit the potato mixture from the recipe, if you prefer.